It didn’t happen for me. Not because I was too busy and not because I was too tired either. It was all because of my pram. A pram I loved, actually, but which was just slightly too wide to fit and steer through narrow aisles in the bookshop. It was too bulky for me to feel comfortable taking up space in the cafe. And I couldn’t manage it alone on even short flights of steps for love or money. You see, even though a newborn is the perfect companion for all those activities (because they sleep so much of the time! ), you need the right gear. Ergobaby understands that what a great baby carrier really gives you is freedom and choice. Freedom to pop your baby in the carrier, grab your phone and keys, and just go. And that freedom is the reason that the new three position Adapt Carrier ($219) is such a great new addition to their range. It’s the first of their carriers that doesn’t need an infant insert – you could literally slip the baby into it as you leave the delivery ward. And yet, this same carrier will see you through to toddler days, because its easily adjustable design means it provides ideal ergonomics even once that quiet newborn has become a chatty little person who just likes to be carried. With the Adapt carrier, the wearer retains all the comfort of Ergobaby’s other carriers, but with extra adjustability in the waistband, and more lumbar support so the Adapt can be worn comfortably for even longer. 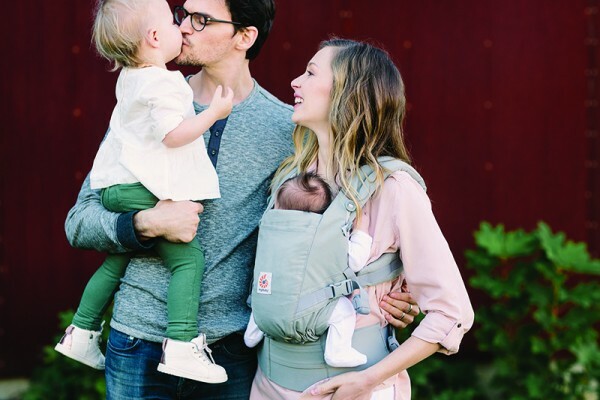 And there’s choice in how you want to wear your baby, with three positions depending on your baby’s age and your mood, and the option to criss-cross the shoulder straps if you prefer to wear the carrier that way. We are looking for product testers to try out the Adapt Carrier and answer a few questions about their experiences with it. We’re looking for a wide variety of real parents – a mix of mums and dads of different heights and sizes, some living in the city, others in the country, some using the carrier for bushwalks, others for the daycare run or on the bus. You don’t need to have just had your first baby – on the contrary, we want to hear from a wide variety of families, big and small. The baby who will use the carrier needs to be between birth and 12 months. To enter, please fill out the form below with a full size family photo, describing your family and lifestyle, and telling us how you’d fit the Adapt Carrier into your day-to-day. Cramped bookshops might not be your thing, but we’d love to hear what is! The deadline for entries is 17 June 2016.